The RP Photonics Buyer's Guide contains 4 suppliers for thin-disk lasers. 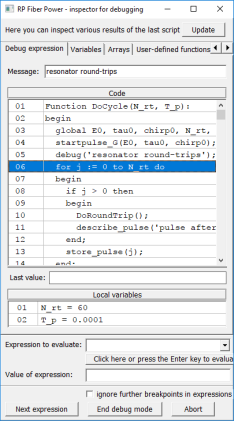 The software RP Resonator can be used to design laser resonators for thin-disk lasers with very high output powers. One can, for example, take into account thermal effects on laser mirrors. The thin-disk laser (sometimes called thin-disc laser or active-mirror laser) is a special kind of diode-pumped high-power solid-state laser, which was introduced in the 1990s by the group of Adolf Giesen at the University of Stuttgart, Germany [2, 18]. The main difference from conventional rod lasers or slab lasers is the geometry of the gain medium: the laser crystal is a thin disk (see Fig. 1), where the thickness is considerably smaller than the laser beam diameter. The heat generated is extracted dominantly through one end face, i.e., in the longitudinal rather than in the transverse direction. The cooled end face has a dielectric coating which reflects both the laser radiation and the pump radiation. The thin disk is also often called an active mirror , because it acts as a mirror with laser gain. Within the laser resonator, it can act as an end mirror or as a folding mirror. In the latter case, there are two double passes of the laser radiation per resonator round trip, so that the gain per round trip is doubled and the threshold pump power is reduced. Figure 1: Schematic setup of a thin disk laser head. The pump optics (not shown) are arranged for multiple passes of the pump radiation. The heat is extracted in the longitudinal direction, which minimizes thermal lensing effects. The thin-disk laser should not be confused with the rotary disk laser, where the gain medium is a quickly rotating disk, which is usually a few millimeters thick. The small thickness of the disk typically leads to inefficient pump absorption when only a single or double pass is used. This problem is normally solved by using a multi-pass pump arrangement, which can be made fairly compact when using a well-designed optical setup, typically containing a parabolic mirror and prism retroreflectors. Such arrangements easily allow one to arrange for e.g. 8 or 16 double passes of the pump radiation through the disk without excessively stringent requirements on the pump beam quality. Compared with high-power fiber lasers, thin-disk lasers have lower demands on the brightness of the pump diodes. However, the required brightness is higher than for some slab lasers and other side-pumped lasers. The pump source of a thin-disk laser is usually based on high-power diode bars, either in fiber-coupled form or with free-space power delivery. A typical pump wavelength is 940 nm for Yb:YAG, whereas ytterbium-doped tungstate crystals can be more efficiently pumped near 981 nm. Your browser does not support the video tag. However, you can download the MP4 video file. Figure 2: A video showing the operation principles of a thin-disk laser. (Click on the image to start the video.) The video has been kindly provided by Martin Hoffmann <hoffmann.martin@gmail.com>. Due to the small thickness of the disk (e.g. 100–200 μm for Yb:YAG), the temperature rise associated with the dissipated power is small. (It is not relevant that the density of heat generation is rather high, because the heat is generated very close to the heat sink.) In addition, the temperature gradients are dominantly in a direction perpendicular to the disk surface and thus cause only weak thermal lensing and depolarization loss. This allows for operation with very high beam quality due to the weak thermal beam distortions, and stable operation can be achieved over a wide range of pump powers. A very important property arising from the thin-disk geometry is power scalability in a strict and meaningful sense. The scaling procedure is simple: for example, the output power can be doubled by applying twice the pump power to twice the area on the disk, while keeping the disk thickness and doping level constant. The laser resonator has to be modified so as to double the mode area in the disk. With this scaling procedure applied, the new design with twice the output power has unchanged peak optical intensities and a nearly unchanged maximum temperature in the disk (the latter essentially because the cooling area has also been doubled). As far as thermal lensing results from the temperature dependence of the refractive index, the dioptric power (inverse focal length) of the thermal lens is reduced to half of the original value, which just compensates the doubled sensitivity of the larger mode to focal length changes. The power has thus been scaled without increasing optical intensities, the magnitude of temperature rises, or thermal lens problems. Strictly, thermal lensing effects can be increased by the power scaling as far as they result from mechanical stress in the disk, but this effect can be kept small by keeping the disk thickness small. Another limitation arises from amplified spontaneous emission (ASE) in the transverse direction, which ultimately limits the gain achievable in the longitudinal direction, but becomes severe only at very high power levels with many kilowatts from a single disk. The use of a composite disk with an undoped part on top of the doped part can also strongly suppress ASE; at least for continuous-wave lasers, the ASE limit may be pushed to the order of 1 MW from a single disk. Power scalability in a wide range is achieved even for passively mode-locked thin-disk lasers (see below). Here, the doubling of the output power also involves doubling of the mode area on the SESAM, so that optical intensities in that device and also cooling issues are – contrary to naïve expectations – not limiting factors. Limitations rather arise from the challenge of implementing dispersion compensation at high power levels. Figure 3: Setup of an 8-kW laser based on four thin-disk laser heads (seen on the left side). The photograph was kindly provided by TRUMPF. So far, around 500 W of output power in a diffraction-limited continuous-wave beam have been obtained with a single disk, or around 1 kW using two disks. In multimode operation, more than 4 kW per disk are possible, and e.g. 16 kW using four disks in one resonator. Multimode thin-disk lasers with 16 kW output power are commercially available, and similar or even higher power levels in nearly diffraction-limited beam appear to be feasible. With mode-locked thin-disk lasers, over 240 W of average output power has been achieved [37, 38]. The most often used gain medium for thin-disk lasers is Yb:YAG. Compared with Nd:YAG, it has a shorter emission wavelength (typically 1030 nm), a smaller quantum defect (reducing the dissipated power), a longer upper-state lifetime (improving energy storage for Q switching), and a larger gain bandwidth (e.g. for shorter pulses with mode locking). On the other hand, it is a quasi-three-level gain medium with significant reabsorption at the laser wavelength, and thus requires higher pump intensities. The thin-disk principle is well adapted to these parameters. For broad wavelength tuning and for ultrashort pulse generation, other ytterbium-doped gain media offer a still wider gain bandwidth. Examples are tungstate crystals (Yb:KGW, Yb:KYW, Yb:KLuW), Yb:LaSc3(BO3)4 (Yb:LSB), Yb:CaGdAlO4 (Yb:CALGO) and Yb:YVO4. Particularly promising are novel sesquioxide materials such as Yb:Sc2O3 , Yb:Lu2O3 [20, 28] and Yb:Y2O3, having excellent thermo-mechanical properties and a potential for very high output powers and high efficiencies. A slope efficiency of 80% has been demonstrated with Yb:Lu2O3 . Research is under way concerning the use of titanium–sapphire disks [42, 44, 45], offering an extremely broad gain bandwidth for pulse generation in the sub-100-fs region. Nd:YAG or Nd:YVO4 may also be used in thin-disk lasers, e.g. when a wavelength of 1064 nm is required, or when the much smaller saturation energy of Nd:YVO4 is relevant. Generally, a high doping concentration is desirable for thin-disk gain media. This allows one to use a rather thin disk (and thus to minimize thermal effects) without arranging for too many passes of the pump radiation. Most ytterbium-doped gain media are quite favorable in this respect. Some materials, particularly laser glasses, which exhibit only weak pump absorption, are not well suited for the thin-disk geometry. An interesting consequence of the small disk thickness is that spatial hole burning usually cannot be avoided, even if a thin-disk laser is built with a ring resonator. (Note that due to the small ratio of thickness and beam radius, counterpropagating waves in the disk always have a strong overlap, so that an interference pattern is generated even in a ring resonator.) Nevertheless, single-frequency operation is possible by using an appropriate wavelength filter (etalon) in the resonator. For passive mode locking (see below), spatial hole burning in the thin disk distorts the shape of the gain spectrum, causing a variety of instabilities, but also allowing for significantly shorter pulses in the optimum range of parameters . Thin-disk lasers are well suited for generating high-energy nanosecond pulses with high beam quality, as required for, e.g., some kinds of laser material processing. The typically used gain medium Yb:YAG offers a significantly better energy storage (longer upper-state lifetime) compared with, e.g., Nd:YAG. A limiting factor, however, is the moderate gain (compared with that of an end-pumped rod laser), which makes it difficult to achieve very short (few-nanosecond) pulses with simple Q switching. The combination with cavity dumping is required to obtain short pulses. One of the initial challenges was to find a suitable mode-locking mechanism. Even though originally it was widely believed that passive mode locking with semiconductor saturable absorber mirrors (SESAMs) would not be possible at very high power levels – at least not without first developing special high-power SESAMs, possibly based on improved semiconductor materials –, the author's research group at ETH Zürich demonstrated around 2000 that both thermal and non-thermal issues can be relatively easily managed even at very high power levels, if only the design parameters of the overall laser system (and not only of the SESAM) are properly chosen. In other words, SESAM damage then does not constitute a limiting factor for the power scaling of mode-locked thin-disk lasers; in fact, it was found that the mode-locked thin-disk laser is the first truly power-scalable femtosecond laser. However, the design of such lasers involves a number of subtle issues, related to e.g. spatial hole burning and to dispersion compensation, and a trial-and-error approach not based on a solid understanding of various details is prone to fail, e.g. by not managing to suppress certain types of instabilities. Thin-disk lasers have lead to the highest average output powers of far over 100 W from a mode-locked laser [30, 35, 37]. Pulse energies of > 10 μJ combined with sub-picosecond pulse durations are possible [23, 24, 26], or 80 μJ in picosecond pulses . While typical pulse durations with Yb:YAG are around 700–800 fs, significantly shorter pulses are possible, e.g. with ytterbium-doped tungstate crystals such as Yb:KGW or Yb:KYW . Even with Yb:YAG, pulse durations around 200 fs have been demonstrated with Kerr lens mode locking [32, 36, 43, 48]. Thin-disk laser heads can also be used for regenerative amplifiers . The relatively small gain of the thin disk can be compensated with a larger number of resonator round trips, even though this makes the amplifier more sensitive to optical losses and nonlinearities (e.g. in a Pockels cell). Therefore, it can be advantageous to arrange for multiple passes of the signal radiation through the disk in each resonator round trip. Substantial pulse energies are then possible even without using chirped-pulse amplification. It is also possible to construct a purely multipass amplifier (without a resonator and optical switch), but this approach limits the overall gain and requires a carefully optimized setup in order to preserve a high beam quality. High-power continuous-wave green lasers can be easily realized in the form of intracavity frequency-doubled thin-disk lasers. 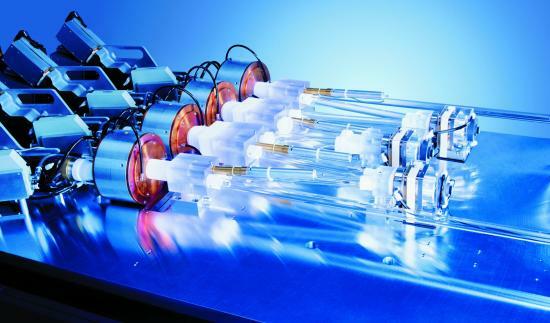 For Q-switched or mode-locked lasers, extracavity doubling is often more practical. Thin-disk lasers are also very interesting pump sources for optical parametric oscillators, amplifiers and generators . A high-power RGB source based on a mode-locked thin-disk laser has also been demonstrated . The high peak power of mode-locked thin-disk lasers allows for efficient nonlinear frequency conversion with critical phase matching in LBO crystals, thus not requiring temperature-stabilized crystal ovens for most or all conversion stages. The thin-disk laser concept allows for further variations. For example, side pumping of the disk may allow for even higher output powers while reducing the requirements on the pump beam quality. This approach, developed at the Lawrence Livermore National Laboratory, is based on a composite laser crystal . An undoped YAG disk, which is bonded to a Yb:YAG disk, brings various benefits: It reduces the beam quality requirements for the pump source, reduces the tendency for transverse amplified spontaneous emission (ASE) and parasitic lasing in large disks, increases the mechanical strength and may improve the cooling. The side-pumped concept may thus allow scaling to much higher powers, even though not necessarily with diffraction-limited beam quality. An interesting option is to use a composite ceramic gain medium which is ytterbium doped only in the center region and not in the outside regions, which are used only to deliver the pump power. It is also interesting to develop cryogenic thin-disk lasers, as cryogenic cooling greatly reduces thermal effects at high power levels. Thin-disk lasers are currently facing fierce competition from high-power fiber lasers and amplifiers. In continuous-wave operation, these can currently deliver even higher powers in close to diffraction-limited beams. Within the next few years, both thin-disk lasers and fiber lasers are expected to show significant further progress, and it is currently not clear which technology will acquire the larger market share. See also the article on fiber lasers versus bulk lasers. In the domain of ultrashort pulse generation, fiber amplifier systems based on chirped-pulse amplification allow one to reach even higher average powers and shorter pulse durations than thin-disk lasers can generate without amplification. However, such systems are relatively complex, and thin-disk lasers will probably maintain superiority for the direct generation of pulses with high energies, particularly when high pulse quality (concerning temporal shape, low chirp, and stable linear polarization) are required. A key issue in this context is that both the small disk thickness and the larger beam diameter on the disk lead to a nonlinearity which, compared with that of a fiber laser, is smaller by many orders of magnitude, and thus in many cases allows the use of much simpler techniques. A detailed comparison of thin-disk versus fiber lasers is complex and has to take into account many aspects which depend on the particular application. For example, issues such as emission bandwidth, pulse quality and stability of polarization state can be essential in some cases but insignificant in others. The thin-disk geometry is also used in vertical external cavity surface-emitting lasers (VECSELs), a kind of semiconductor lasers. In that case, multiple passes of the pump are usually not required due to the strong absorption of semiconductor materials. However, the concept with multiple pump passes has recently also been applied to such semiconductor lasers, where it allows for a reduced quantum defect and thus for reduced heating and potentially higher powers . To date it is not clear whether this will lead to more efficient and practical lasers; tens of watts of output power have so far been reached with the original concept, not requiring multiple pump passes. Such lasers are actually very interesting, partly because they can be developed at different wavelengths, e.g. for blue light generation with intracavity frequency doubling at very high output power levels. If we attenuate a laser beam (e.g. by sending it through an absorber), will that modify its relative intensity noise? (a) No. The power fluctuations relative to the average power will remain unchanged. (b) Yes. The relative power fluctuations will increase, since we have to consider the squares of the power deviations. (c) It depends. Relative intensity noise near the shot noise level will be increased, much stronger intensity noise will not.